Intel NUCs with ESXi are being used as home servers and in many home labs. If you are generally interested in running ESXi on Intel NUCs, read this post first. One major drawback is that they only have a single network port. There are USB NICs in the market, but for ESXi hosts they only work in path through mode. That means that USB NICs can only be used inside VMs and not for the hypervisor itself as vmnic. The slightly older 4th Gen NUCs had a Mini PCIe slot that allowed an additional NIC to be installed. With that port it was possible to install a Syba Mini PCIe NIC for example. Nevertheless the adapter is unsupported with ESXi and did not fit into the NUC chassis, there are solutions. Unfortunately, the 5th Gen NUC does no longer have a Mini PCIe slot. Instead it has M.2 slots. An easy solution would be a M.2 NIC, but until today there are no such cards available. In this post I will explain the possibilities to use PCIe cards with the M.2 slot to upgrade the 5th Gen NUC with additional NICs or other cards like Fibre Channel HBAs. M.2 is also known as Next Generation Form Factor (NGFF). It is a specification for internally mounted computer expansion cards. It is the successor to the mSATA standard, which uses the PCIe Mini Card physical card layout and connectors. M.2 is a very flexible standard that allows different module sizes and various interfaces. As M.2 cards are available in many possible variations, they are divided into different Form Factors and Keys. Form Factors - M.2 devices are denoted using a WWLL naming schemes, where "WW" specifies the modul width and "LL" specifies the module length. You can find notation like "M.2 2280 Module" in the NUC documentation. Keys - M.2 modules provide a 75 pin connector. Depending on the type of module, certain pin positions are removed to present one or more keying notches. Host-side M.2 connectors may populate one or more mating key positions, determining the type of modules accepted by the host. There are 12 different keys specified (Key A-M). Two M.2 cards. First with Key B/M, second with Key A/E. Not all 5th Gen Intel NUCs have the same M.2 slot but the slot I am mainly talking about in this post is available on all NUCs. It's the slot where you add the M.2 SSD. Only one NUC, the NUC5i5MYHE provides a second M.2 slot (Which provides a differnt key). Instead of the second M.2 slot the other NUCs have a presoldered WiFi module. The P14S-P14FP adapter has a Key B interfaces which is available on all 5th gen NUCs. 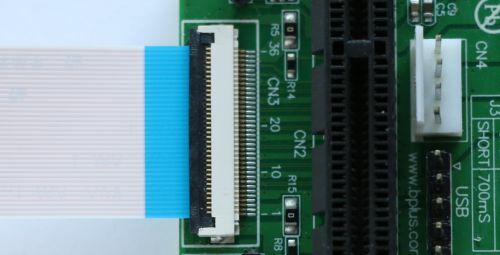 It converts the M.2 slot to a PCIe X4 slot where you can insert your PCIe network adapter. My fist attempt to install the P14S-P14FP adapter was unsuccessful. The problem is that M.2 only provides 3.3V and PCIe Cards require both, 3.3V and 12V. 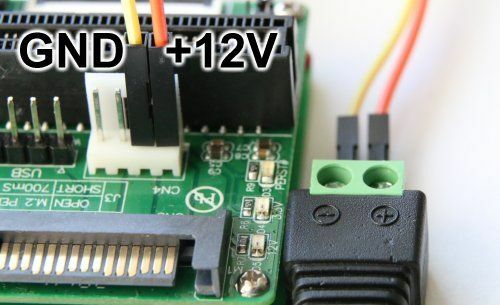 To solve that issue, the P14FB provides a 4pin FDD power jack and a 15pin SATA power jack. Unfortunately, the NUC neither has one of that connectors, nor it has any internal 12V headers. The only solution is to use an external power adapter. Any 12V power adapter should fit. I am using one from a portable hard drive. 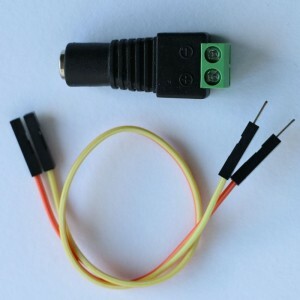 I connected it to the 4pin FDD power jack by using a "5.5 mm Female DC Power Connector" and a "2 Pin Male to Female Jumper Wire". Make sure that your know the polarity. It is common, that + is on the inside, but some adapters might differ. The power adapters polarity should be written on the label. In doubt, use a multimeter. Of course, this is in no way a supported configuration. It's only for engineering purposes. I can't guarantee that it will work, or that it don't break your components. Install the P14S into the NUCs Key B M.2 Slot. It's a 2280 card that fits perfectly into the NUC. Carefully lift the black bracket to an angle of 90 degrees, slide the FCC into the connector (blue side upwards), and close the bracket. The bracket should slightly squeeze the cable, but it should not bend. 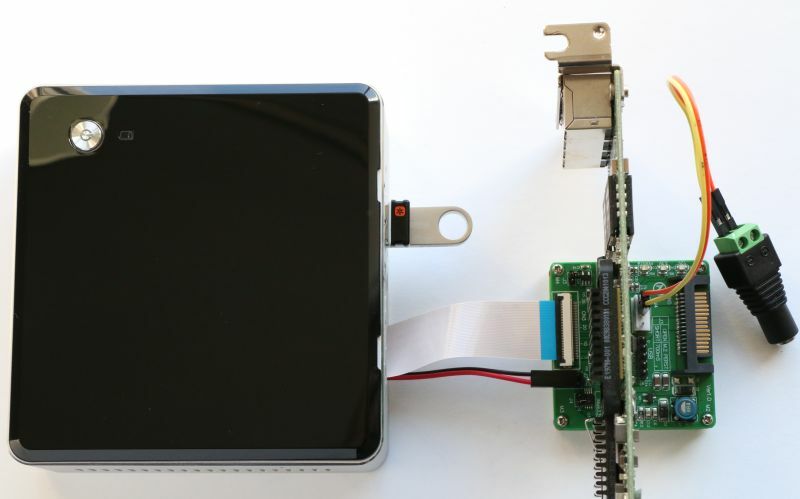 Get the cable out of the NUC. If you have the NUC5i5MYHE, you can remove the serial port bezel and put the cable through. Connect the other side of the FCC to the P14FB PCB. Connect the Dupont 2PIN Cable to both PCBs. Make sure to connect the red wire to the marked pin on both sides. Always plug-in the 12V adapter first. For the first test I am using a network adapter with an Intel 82576 chipset. This is fully supported with ESXi so I do not have any driver issues. If your ESXi does not detect the card you should verify that the NUC has detected it in the BIOS (Devices > PCI). If the card as been detected, you probably have a driver issue in your ESXi. My NUC currently runs with VMware ESXi 6.0.0 build-2494585 (Setup Howto). The card has been detected without any further modification. Some words about the performance. The NUCs M.2 slot is based on PCI Express (PCIe) Revision Gen2 and has 2 lanes (X2). Each lane supports a data transfer speed of 5.0 GT/s (Gigatransfers per second). To get the actual usable bandwidth, you have to take into account that PCIe Gen 2 uses a 8b10b encoding which means that it requires 10bits, to transfer 1 byte (8 bits). Very cool write up. Just an FYI, two models of 5th gen NUC (NUC5PPYH, NUC5CPYH) were released later than the initial models (5i3,5i5,5i7s), and don't have any free M.2 out of the box. 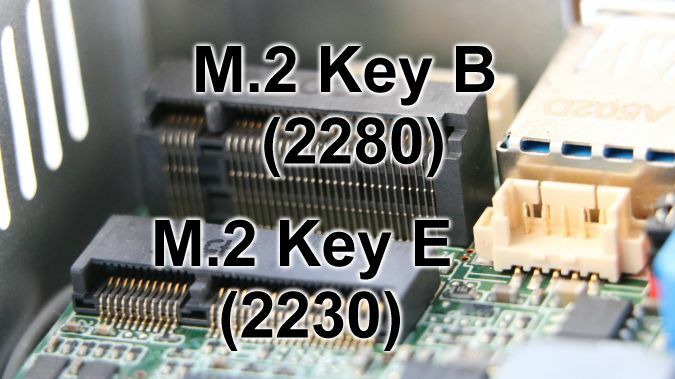 They do have the M.2 Key E (2230) only, and its pre-populated with a Wireless-AC 3165 Intel module. Such a fun read, wow, how innovative/creative/bold, pushing the boundaries of what can be accomplished. at obtainable prices. Updated the post with some performance information. I'm currently building a NAS using an intel NUC, and I have ordered a P15S-P15F to house a mini-PCIe two port SATA controller. In theory this should work, as all the adapter does is bridge the M.2 PCIe interface to a mini-PCIe slot. Did you manage to get it to work? The adapter does not work for me. It does neither work with a mPCIe SSD nor with the Syba gigabit Adapter. As far as I know there are incompatibilites in M.2 keys despite they fit physically. They "can" provide the interfaces defined in the standard, but they are not bound to it. Has anyone come up with a housing? While searching the tubes I found an adapter from m.2 to NIC. They have both 1 and 2 ports. I'm thinking of buying the new 6th gen nuc and install this for using pfsense :) maybe it will work..
Hi Martin did you follow up with your order? is it working? Hi I spoke with Eddie of Innodisk and he told me that these card would not fit in the Nuc's in February a new M2 interface base in the PCIE standards for M2 will be available. I am trying to get my hands on a pair of them for testing and see if they would work. If I can pull it out I will do a review here. Both the P15S-P15F adapter and the SATA controller have arrived so I was finally able to do some testing. Despite the power LED on the adapter being lit, the SATA controller does NOT work. I have then attempted to use a combo adapter which uses USB for bluetooth and PCIe for wi-fi. Interestingly, only the USB bluetooth adapter is detected and not the wifi adapter that is using the PCIe interface. Upon closer inspection of the specification of the m.2 wifi adapter that came with the unit I discovered that it was in fact using a PCIe lane. To sum things up - I know for fact that there is a functional PCIe lane in the M.2 port. The adapter fits. Power and USB work, PCIe doesn't. Intel refuse to provide support and claim that the product was not intended to be used in this configuration. My conclusion is that Intel are simply using a PCIe whitelist. Otherwise, why would one PCIe device work and another wouldn't? Unfortunately, the practical meaning of this is that only M.2 devices that were approved by Intel may be used at this stage. Very bad news. Martin - very interesting discovery. Please let us know if you can find a reseller. Manufacturer is not obligated to implement the PCIe, and has most likely only connected USB to that port. When virtual machines are stored on local storage 1Gb/s is enough but I also share the port with NFS traffic as some VMs are stored on an external storage. Any updates on this? Anyone found a solid solution yet? Looks like two options are avilable but as of now it's not working for other persons. The only other option I can see would be to use usb3 Ethernet ports. Put them in pass through mode. I believe the point of this post is to add NICs to the NUC to be used at the hypervisor level. Passthrough is great for a single VM. Hypervisor will see it as a NIC without passthrough if it supports the chipset on the usb3 Ethernet. Have you had any luck finding or compiling usb3 NICs drivers for esxi 6? To be honest, the theory is correct but I haven't looked into it yet as most on eBay don't list the chipset. Dueltek Distribution Presented: The 100Base Multi-Mode SC Fibre-to-PCI coupler (type TE100-PCIFC) supplies dependable efficiency network from a single desktop pc or server to a Multi-Mode SC-type fibre connector for ranges of approximately two kilometers (1.2 mls). Full-duplex type provides data move speeds of approximately 200Mbps. I add the opportunities to test a new dual M.2 Ethernet card from Innodisk.com and so far its a perfect match. 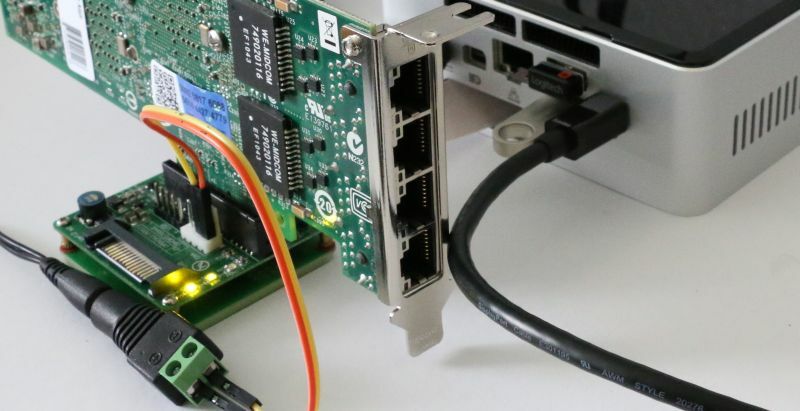 It gives out 2 new extra Ethernet ports to the Nuc without any extra external psu or boards. And the best is that its using an intel Chip set so there is no drivers to install in ESX. So far its the best solution I found. I also had some insight from Eddie Chiu from Innodisk that they are working on a Nuc specific solution that will have all the connector and fitting for the Intel Nuc system. So be patient some interesting stuff is coming. I will also post a full review of the current solution I tested. Hi Stephane, look forward to your review with innodisk NIC and ESX. I am waiting the same solution. Wouldn't this adapter from AliExpress work? A lot cheaper. "standard PCI-e 1x/4x card in M.2 NGFF M key slot in the Desktop or Laptop. Transparent to the operating system and does not require any software drivers. Support 2260/2280 type M.2 SSD module slot. Only Support M.2 Socket 3 PCI-e-based slot." Yes (But I don't know if this adapter works). I didn't find other adapters when I created this article. However, I prefer the USB solution for networking. No. If you look at the picture carefully, the notch is on the right hand side (M key only), and won't fit in a B-key slot.